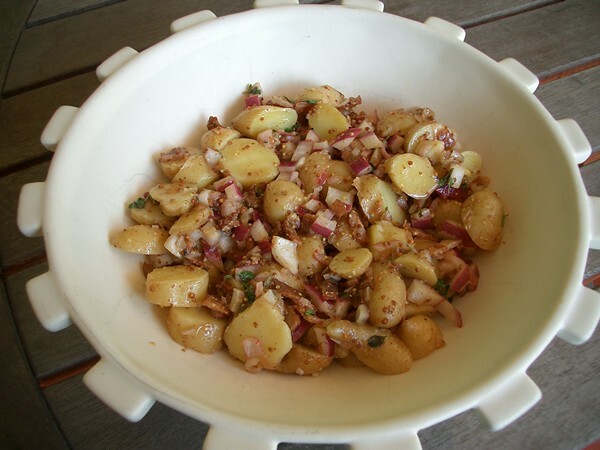 The Accidental Locavore loves to make this easy French potato salad with bacon and red onion. This feed about 4 and is easily doubled or triple if you’re feeding a crowd. Added bonus? Great to take on a picnic, no mayo or eggs to worry about. In a medium sauce pan, cook the potatoes in salted water until tender, about 12 minutes depending on the size of the potatoes. I like a lot of surface area for the potatoes, so I usually cut them in halves or quarters. Drain and put in bowl. Add the onion to the bowl. While the potatoes are cooking, in a small frying pan cook the bacon over medium heat, until crisp. Remove the bacon from the pan and drain on paper towels. Pour the bacon fat into a small bowl. Add the shallots, thyme, vinegar, salt, pepper and mustard and mix until well blended. Taste and add the olive oil as needed, blending to emulsify the dressing. Pour the dressing over the warm potatoes and the onions. Toss to mix. Refrigerate until cool, serve and enjoy.